4. Materials on works must be delivered word-based or image-based for competition. Meanwhile, the electronic document of above materials shall be sent to the email (chinafdc2007@163.com) of the organizing committee. 4. Board and lodging expenses of participants, of which work is qualified for the quarter-final and the final, during the quarter-final and the final in Hangzhou shall be assumed by the organizing committee。The organizing committee will provide certain subsidies for the transportation expenses of the participants in the quarter- final and final to and form Hangzhou. 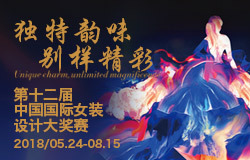 The top 30 sets of works shall be come to Hangzhou for video interview and assessment. The top 20 participants will be qualified for the final. The interview and assessment scores will be included in the results of the final. The organizing committee is established in Hangzhou Fashion Designer Association. For any questions, please contact the committee.